These cupcakes have almost rendered me speechless. Trying to come up with the words to describe the incredible flavor experience that these provide is no small task. These lemon beauties topped off an Italian-themed meal (one that had begun with the Fontina-Stuffed Bacon-Wrapped Dates as an appetizer) and was the perfect clean-flavored dessert that I was looking for. There are three levels of lemon flavor in the cupcakes that combine to deliver the perfect balance of tart and sweet, and had people fighting over the last cupcake (seriously). 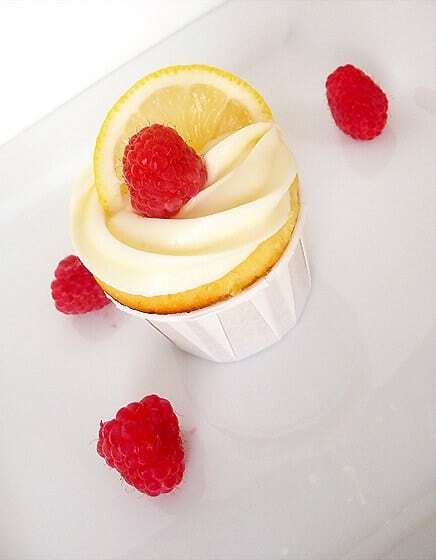 The batter is flavored with lemon zest, lemon juice and a punch of limoncello; a tart lemon curd fills the inside of the cupcakes, and on top sits a sweet cream cheese frosting with the subtle tang of limoncello. These are simple and classy, a perfect dessert for a summer meal. Although comprised of three separate steps, these cupcakes are simple to put together and not very time consuming. While the cupcakes are in the oven baking, the lemon curd can be made in less than 10 minutes. While the cupcakes and curd cool, make the frosting and then you are ready to assemble and serve! 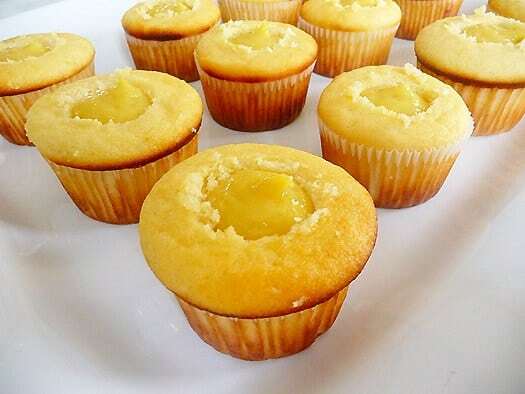 I tasted a spoonful of lemon curd before assembling the cupcakes and thought it might be a bit too tart, but was pleasantly surprised when I tasted the entire cupcake. The curd didn’t appear too tart at all, and was perfectly balanced by the cake and frosting. As you can see, I popped the finished cupcakes into an additional liner – Wilton Nut & Party Cups – for a prettier presentation. If you want to make homemade limoncello, you can certainly do so, but plan ahead! Homemade recipes require 7 to 10 days of the lemon steeping in vodka before proceeding with the rest of the recipe. If you want to give it a go, you can find recipes here and here. These cupcakes have been entered into Bake at 350’s Flavor of the Month event for August: PUCKER UP! Lemon, Lime or a combination. Head on over to check out the event, see what everyone baked up, and find out next month’s theme. 1. Prepare the cupcakes. Preheat the oven to 350 degrees F and position a rack in the center. In a medium bowl, combine the flour, baking powder and salt; set aside. In the bowl of an electric mixer fitted with a paddle attachment, beat the butter, cream cheese and sugar on medium speed until light and creamy, 2-3 minutes. Add the eggs, one at a time, beating well after each addition. Add the limoncello and beat an additional minute. On low speed, add flour mixture and buttermilk alternatively, beginning and ending with the flour mixture. Add the lemon juice and zest and mix on low speed just until incorporated. Divide the batter between 12 muffin tins. Bake for 20 minutes or until a toothpick inserted near the middle comes out clean. Let cool completely. 2. Prepare the lemon curd. In a heavy medium saucepan, stir together the lemon zest, juice and sugar and bring to a simmer over medium heat. In a small bowl, whisk together the egg and egg yolk. Whisk the lemon mixture into the eggs to temper them. Scrape the mixture back into the saucepan and place over medium heat, whisking constantly until it thickens, about 5 minutes. Remove from the heat, and let cool completely. 3. Prepare the cream cheese limoncello frosting. In the bowl of an electric mixer fitted with the paddle attachment, beat the butter and cream cheese on medium speed until light and creamy, about 2-3 minutes. Add the limoncello and beat for an additional minute. Reduce the speed to low and gradually add the sifted powdered sugar and beat until fully incorporated and smooth. 4. Assemble the cupcakes. Cut a hole into each cupcake with the large end of a melon baller or the back end of a large pastry tip. Fill each cavity with the lemon curd. Fill a pastry bag with a star tip (I used Wilton 1M) with the cream cheese limoncello frosting and pipe onto each cupcake. Decorate with lemon and berries, if desired. Can the lemon lemoncello recipe be adapted to a cake.? 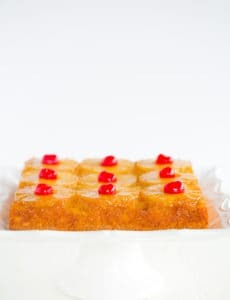 Hi Joyce, I haven’t tried turning it into a cake, but if you do so, you’ll want to double the recipe for a 9×13 or two-layer 8-inch or 9-inch cake. 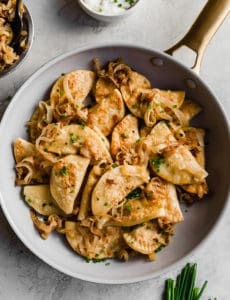 This recipe is absolutely wonderful. It’s delicious, just a little tartness from the curd to balance the sweetness of the frosting. I’ve even doubled the batter recipe to make a cake and use the curd in between the layers and its still just as delicious. I made these cupcakes for Christmas last year they were delicious! They freeze well too! I will definitely make them again for this Christmas. Can’t believe this recipe had only one review! This has been a go to recipe for me since 2010! Amazing lemon curd and amazing cupcakes!!! 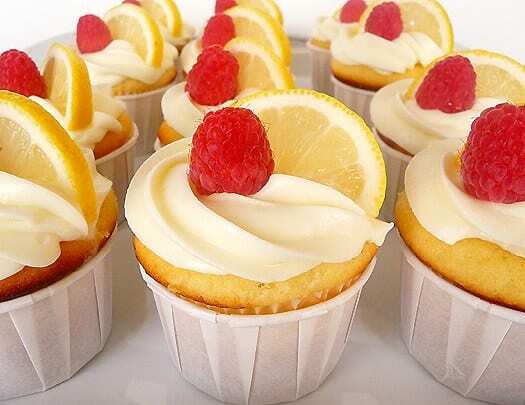 I made these last night and they were the most delicious lemon cupcakes I’ve ever had! My husband raved about them and he isn’t much of a cupcake guy. I will never buy lemon curd again! Would the lemon curd be okay to make the day before and place it in the refrigerator? I have made these in the past and they are hands down the best cupcakes I’ve ever made, THANK YOU!!! 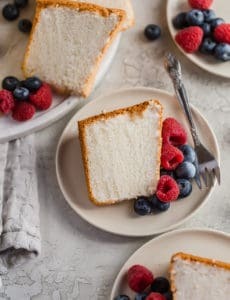 Questions for you, I’d like to make this into a naked layer cake… 1) Do you think adding blueberries to the batter would be okay, or would they possibly mess with the texture? 2) Do you think your measurements for 1 dozen cupcakes equates to about 1 – 8″ or 9″ round single layer? Thank you so much! Hi Elizabeth, I think the blueberries SHOULD be okay, and yes, 12 cupcakes should equate to a single layer 8 or 9-inch cake. Hello again! I will be making these cupcakes as well as salted caramel, vanilla (easy vanilla buttercream), chocolate (best choc). I have to make tons for a wedding and would prefer to frost them on-site. Can I prepare the frosting the day before? If so, how do I store it and then just remix before frosting? Hi Juli, You can definitely make the frosting the day before. Store it in the refrigerator; the next day let it come to room temperature and give it a good hearty stir with a rubber spatula. If it’s too stiff, you may need to beat it briefly with a mixer to get it nice and smooth again. So good! Perfect level of sweetness. I made the cupcakes and filling yesterday, then filled and frosted them today for a baby shower. I was asked multiple times where I bought them. That felt good. Since I couldn’t possibly waste them, the leftover moist little centers of the cupcakes will be paired with whipped cream & strawberries for dessert tonight. And more limoncello. I have been asked to make these for a bridal shower. I was wondering about freezing them so I can make them a week or two before. I have been told that cupcakes should be kept air tight until it comes to room temperature and then they should be opened. I am wondering if I need to do something different since they have a filling? Have you had any experience freezing these or other cupcakes? Have you ever froze cupcakes with frosting on them? Thanks!! Hi Vicki, I usually do not recommend freezing cupcakes with frosting, as the texture can be compromised, but rather freeze the cake part and frost them a day in advance or so. I’ve made these cupcakes several times over the past few years and they are 100% the most delicious thing to ever exist, and my whole family thinks so too. I love the unique texture of the cake. Thank you for this amazingness!! I know you probably get a ton of mail! But could I make these without the lemon curd and just top with a dark chocolate frosting? I love lemon and dark chocolate but wondered what you thought. . .thanks! Hi Jennifer, Yes, you could definitely do that, sounds awesome! You should double the recipe for a 9×13 pan. I hope that helps! I just finished making these as a teacher gift, and of course I had to steal one. Then my kids each stole one, and now the teacher will get to enjoy 9 of the most amazing lemon cupcakes in the world! Thanks for posting such great recipes! Pingback: The Weekend Dish: 9/27/2014 : Best of Baking with Pinterest! Thanks for another wonderful cupcake recipe! I just have a question about the lemon curd. I doubled the entire recipe. I ended up with 28 cupcakes, but I did not end up with very much lemon curd, only about 3/4 cup. Did I do something wrong, or should I just cut out very small pieces of cake so I only put a little lemon curd in each cupcake? Or do you think I did something wrong? Thanks! Hi Michelle, I answered my own question. I had just the right amount of lemon curd for 24 cupcakes. My husband loved the lemon curd so much I’m going to make more for him to put on his toast in the morning! The cupcakes were a hit for my husband’s birthday happy hour. I doubled the amount of limoncello and added more powdered sugar in the frosting. Hello! 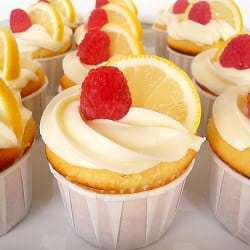 I would love to make these cupcakes for my class’s bake sale but I’m not sure if young students are allowed to eat baked goods with liqour in it, in this case limoncello. And if I can’t what type of replacement can I use? Looks amazing by the way! If you can’t use the liquor, then you can substitute lemon extract, but a very small amount will go a long way to achieve the lemon flavor. Limoncello is much subtle in flavor.